Prefab homes have changed a lot in the last few decades. What was once run-of-the-mill, cookie-cutter monotony is now rich in interesting and ground-breaking designs. Often self-build or architect-designed dwellings run far over budget for the average house builder, and when paired with long time-frames and plenty of decision related hold ups, prefab homes start to offer a surprisingly alluring alternative. 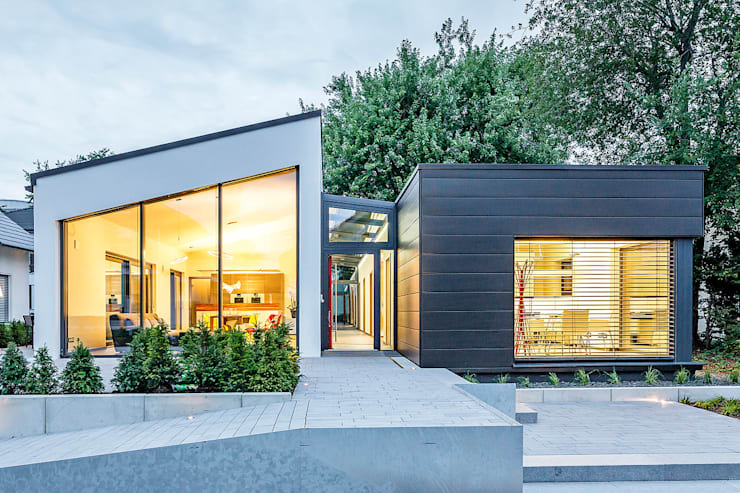 The first prefab modular home we are taking a look at today has been designed by Dingemans Architectuur, and boasts a long linear format. 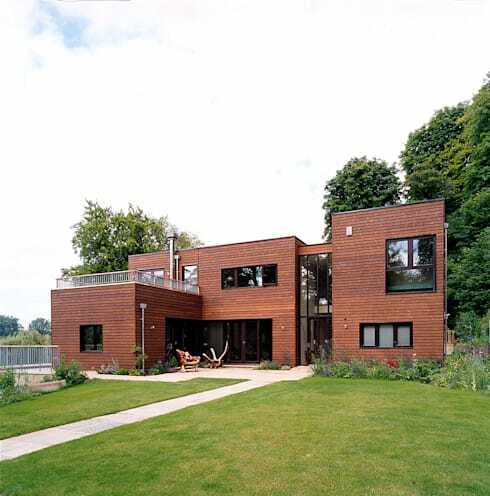 Raised from the ground, the home enjoys a long timber deck entrance, which opens up to two large glazed doors. Glass has been installed in ample supply for this dwelling, ensuring each room is filled with natural illumination, as well as creating a series of fabulous vistas for the occupants within. 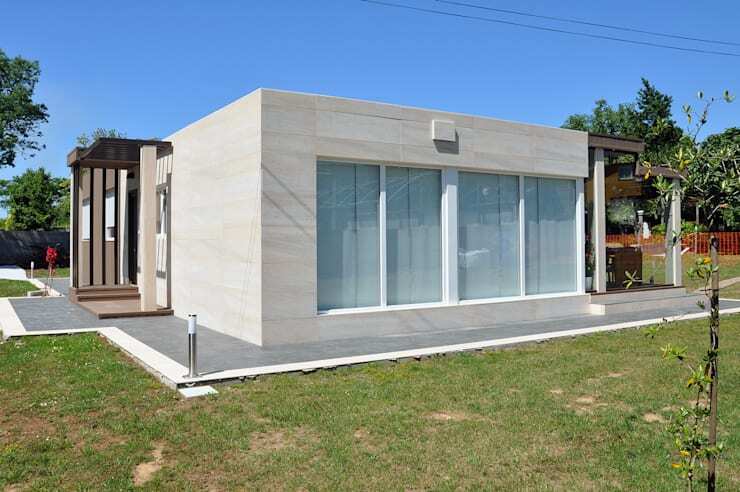 Exterior de una casa de 100 metros cuadrados. Ventanal en el salón comedor. Next up, we check out a white cube home, which looks more like an architecturally designed individual freestanding home, than a modular prefab setup. Designed by Casas Cube, this dwelling comes replete with textured stone stucco, terraced dining, and plenty of glazed sections to enhance the interior illumination. 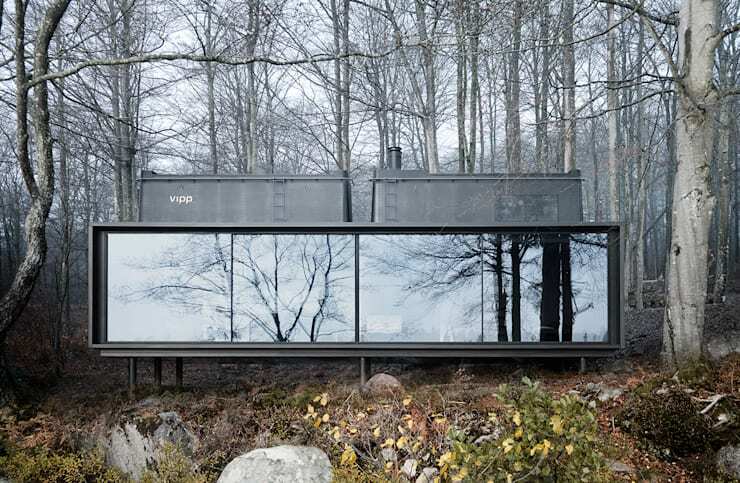 Designed by architects in Denmark, next up we have The Vipp Shelter, planned by the firm of the same name. This impressive structure owes its industrial aesthetic to the shipping container setup that brings a raw modernity to the shape and form. 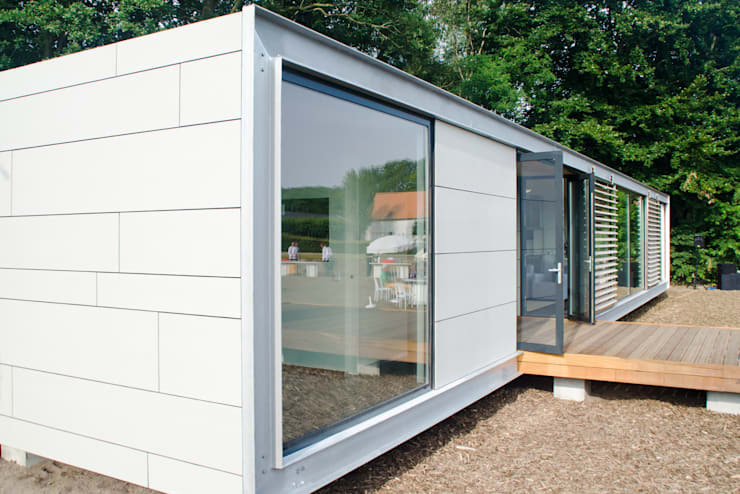 Truly ingenious, unique and overwhelmingly eye-catching, this sophisticated prefab abode is ideal for those who like to stick out from the crowd. Inside the colour scheme is dark and alluring, with charcoal tones and a sense of captivating drama. Large, luxurious and extremely attention-grabbing, this house wows with its sheer size and impressiveness. Utilising a textured timber cladding, the dwelling enjoys a large upstairs terrace, downstairs exterior al fresco space, and plenty of room for the whole family. 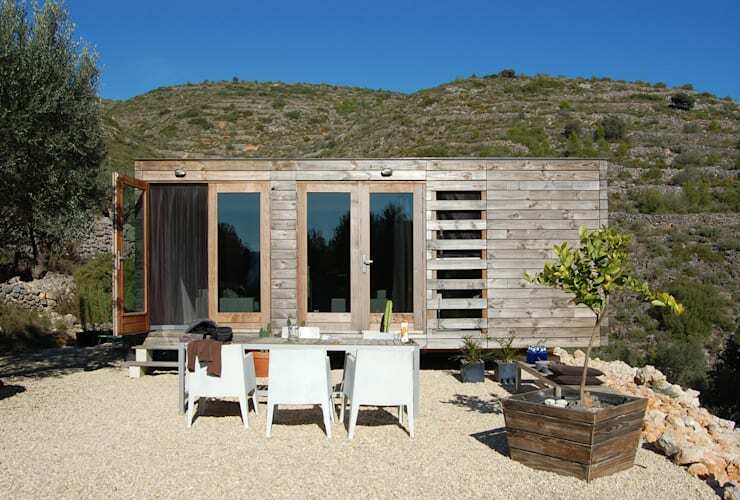 Situated in the lap of a mountain, this eco-home takes raw timber and creates an incredibly welcoming, compact abode. Designed and constructed by Daniel Marti, owner of DMP Arquitectura, this dwelling was an exercise in creating a property that embraced a strict budget, without sacrificing quality. A wonderful success story, the residence turned out a complete inspirational structure, embracing the natural landscape with its green attitude and sustainable production. A fresh take on the traditional family home, this new-age and avant-garde design takes tradition and flips it on its head. Utilising modular sections, connected via a glazed hallway, this abode incorporates large open-plan areas to bring together a cohesive and connected aesthetic. Ssangdalri House, designed by Seoul-based Hyunjoonyoo Architects is a truly unique prefab dwelling. 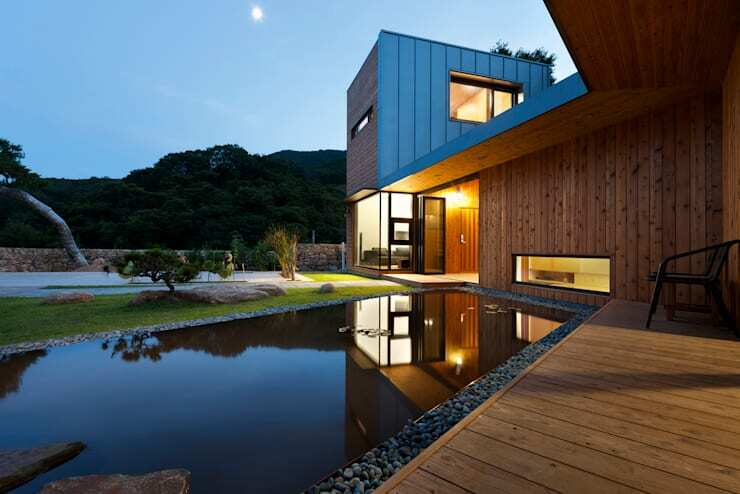 Nestled in the South Korean countryside, the home utilises timber cladding to connect with the surrounding landscape, while the architects have employed feng-shui techniques to impart a Zen-like quality throughout. Which prefab home is your favourite? Let us know below!